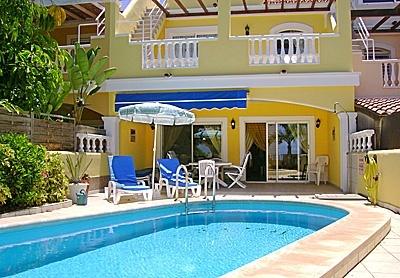 Villa Felipa is a two bedroom two bathroom villa, which is situated in the Costa Adeje Golf area of Tenerife. The most amazing feature of this villa is the brilliant views across the golf course and out to sea. The villa is conveniently located as it is also close to beaches, restaurants and bars and just a 2 minute drive from the picturesque coastal village of La Caleta. The outside area includes a private pool surrounded by a sun terrace. There is also a covered terrace with a patio table and chairs, which is great for alfresco dining. The villa is laid out over 2 floors. The living area on the ground floor consists of a comfortable lounge and dining area, with patio doors leading out the sun terrace. Upstairs there are two bedrooms, both with balconies with the amazing sea view. One of the bedrooms has a double bed and the other twin beds. The master bedroom has an ensuite bathroom and there is a separate shower room. Patio doors from the dining area lead out to the covered terrace which has comfortable patio furniture. This is an ideal place to sit and enjoy a glass of sangria, whilst taking in the beautiful panoramic views of the golf course and sea, across to neighbouring island La Gomera. The oval swimming pool measures 6 x 2.9m and can be accessed via ladder steps. There is also a built in barbecue for guests use and an open poolside shower. This prestigious villa is two minutes drive away from the picturesque fishing village of La Caleta with traditional fish restaurants, tapas bars and superior restaurants. A few minutes along the coast are several five star hotels where guests can go and enjoy the facilities. The famous Bahia del Dulque hotel epitomises the luxurious feel of this area and has a beautiful sandy beach for the use of the public. There is a designer shopping centre located here and a little further along the sea promenade is the start of the long, golden sand Fanabe beach which leads all the way to Las Americas and has a huge selection of restaurants and small shops along the sea front. The old town of Adeje is a kilometre inland and still retains it’s characterful charm with old buildings and traditional restaurants. For the energetic it is the starting point for the Barranco del Infierno walking tour. Further inland is Mount Teide, the highest mountain in Spain, which has a cable car to the top and views of all the other Canarian islands. The villa is near to all sea activities, including fishing, diving, scuba diving and many boat excursions including a thirty five minute ferry sailing from Los Cristianos to the neighbouring island of La Gomera with its fabulous rain forest. For the golfer this holiday villa is on the edge of the most exclusive golf course in Tenerife, with several more golf courses within a short driving distance. The towns of Playa de las Americas and Los Cristianos, in the south of the island, have superb, sophisticated shopping and are the hub of the night life, with bars, discos and shows where the entertainment can continue, in some places, until breakfast. The Villa is only fifteen minutes drive from Reina Sofia Airport, it is perfectly positioned for a memorable holiday. There is a weekly maid service with a mid-week towel change.